I know you'll enjoy my version of a classic Italian dessert. Using vanilla and chocolate pastry creams, raspberries and Italian ladyfingers it's easy to see why Zuppa Inglese is loved by Italians all over the world. 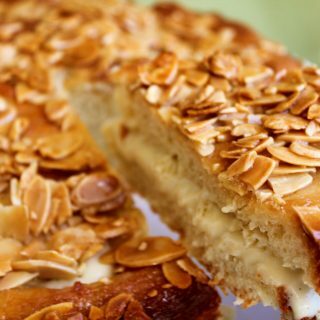 Are you ready to try another classic Italian dessert? Next, to my Tiramisu, Zuppa Inglese is my favorite. This is a dessert Mama Jeanette introduced me to so many years ago. One cold day in November she had asked me I wanted for dessert that night, and without thinking, I said chocolate pudding. As I walked out the door for my day’s work, I saw Mama smile, I had no idea what she was going to make but I knew it certainly wasn’t going to be instant chocolate pudding! She didn’t say a word about dessert until after dinner that evening when she brought a glass bowl filled to the top with deliciousness! Mama Jeanette had made Zuppa Inglese! I had no idea what it was but as I devoured almost half the bowl, she explained it was, in fact, an Italian version of an English Trifle. Many years before her mother had taught her how to make this 17th-century classic, that had come from the Emila Romagna region of Italy. I couldn’t find the Alchermes (a very bright red herbed cherry Liquor) that goes into this classic dessert. I had gone to one of our Liquor superstores to find that concoction, and when I stopped a worker to ask if they had it, he so enthusiastically asked in a very heavy Italian accent if I was making Zuppa Inglese! I laughed and said yes I was and how did he know and did he have it? His instant reply was no, and that Zuppa Inglese was the only thing it was ever used for. He then began telling me how his Mama had made Zuppa Inglese for him and how much he missed her! I asked him if there was anything close to it and he again replied No, but to use rum and some Maraschino cherry juice instead. I decided to pass on the maraschino cherry juice and instead added a layer of raspberries for that red color. I thought the contrast of flavors would also add another dimension to the dessert. My Zuppa Inglese is actually fairly close to the Zabaglione, and to be honest with you, even when I do make the French version- Sabayon, I never ever use Marsala! I love Marsala with meats but just have never acquired the taste for it in desserts. I made individual portions of this delicious dessert and I have to say the raspberries were essential! I didn’t quite get the separation I was looking for, but oh my did I get the flavors! My only shortcoming was in not using enough of my sugar syrup to really saturate the cookies and they were just a little crunchy, but still very very tasty! 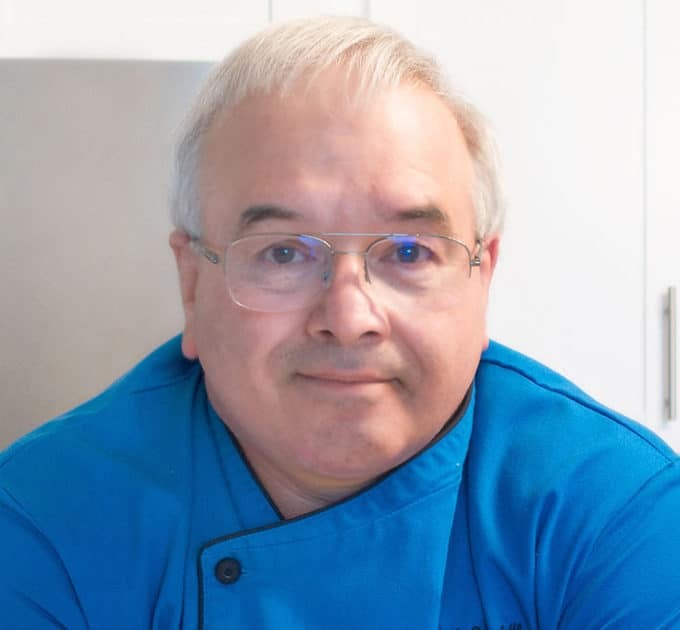 If you’ve tried my Zuppa Inglese recipe or any other recipe on askchefdennis.com please don’t forget to rate the recipe and let me know where you found it in the comments below, I love hearing from you! You can also FOLLOW ME on Instagram @chefdenniseats and @chefdennistravels, Twitter and Facebook. Place the milk, 1/2 cup of sugar, cornstarch, eggs, vanilla and salt in a stainless steel bowl, mix well with a wire whip and place over a pot of boiling water and continue to whip until mixture thickens. Bring 3 cups water,1 cup of the sugar and orange zest to a boil in a saucepan. Boil until reduced by about half. Remove from heat, stir in the rum, and let cool completely. divide whipped cream in half, then divide half of the whipped cream into two parts and fold one part into each of the chilled pastry creams. 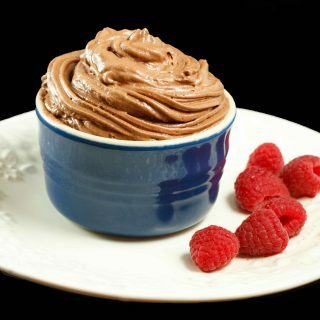 Spread the chocolate pastry cream over top in an even layer, then spread with the whipped cream. crumble any leftover ladyfingers over the top. *letting the zuppa sit overnight will allow the flavors to build, giving you a more flavorful dessert! *These make wonderful individual desserts, use your favorite dessert glasses. I am located in the Philadelphia area, living across the bridge in Jersey and working in Flourtown, Pa.n feeding 600 HS girls, its a small account so most of the work falls to me, including all the admin work as well, and that makes for a long day. I am from San Antonio Texas originally, and its funny but my Mothers maiden name is Cueva, her father Joe was a minister and from Aguas Caliente originally. I haven’t been home in too many years. I would love to show my wife Texas, such a beautiful state. Dennis, I used to work the graveyard shift in a bakery, so I know what those long, arduous shifts are like. Although I’m retired now, I hate to write recipes on my blog, hoping that my readers have the skills and confidence to improvise from guidelines. But I do appreciate your efforts. I discovered your blog only this morning, and I’m pleased with your positive response to my feedback. Where are you located? We are near Pátzcuaro, Michoacán, México. Chef Dennis, I don’t want to be a PITA, but when I was looking over the print copy of this recipe, I noticed that the pastry cream had no sugar in it. Since the total amount of sugar as given in the ingredient list is 1 3/4 cups, and 1 cup of that goes into the syrup, and another 1/4 cup goes into the whipping cream, that leaves 1/2 cup for the pastry cream, which sounds about right to me. Please correct me if I’m wrong. As a suggestion, it could be useful for readers to write, “1¾ cups sugar, DIVIDED”, in the ingredient list. Many of us, including myself, tend to proceed hastily and into a cooking disaster, without such advisories. thank you so much for finding the mistake in the directions, I did as you suggested and added divided to the sugar, you are correct 1/2 cup goes into the pastry cream. Please hang in there with me, I can always use your help in editing! Please feel free to email me anytime you have a question. This is beautiful and just what I was looking for. 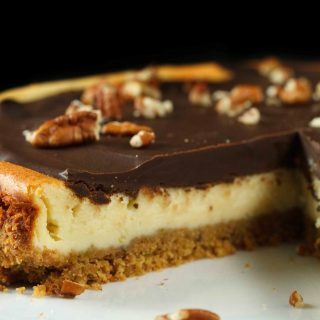 It seems more “do-able” than other recipes I’ve seen on the Web, but it doesn’t “cheat” with pudding mix and the like. One question: the ingredient list mentions the zest of one orange, but where or how is it used in the procedure instructions? sorry about that on the zest, add it into the sugar syrup mixture as your making it. let me know how it comes out when you do make, it’s not at all difficult just a few steps that make it seem a little harder than it actually is. Thanks, Chef Dennis. That makes sense. I wanted to be sure. I love Mama Jeanette stories. 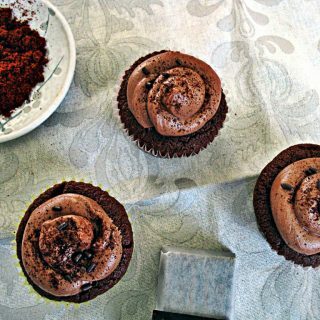 This recipes looks delicious, as always, and raspberries and chocolate – always yum! I like that you swapped the maraschino cherries with raspberries! And rum and orange are such a nice combo…this dish looks delicious! These are amazing and I’ve been inspired to feature them in my Friday Food Fetish roundup. And I’ll be sharing on Pinterest. Please let me know if you have any objections and KEEP IT COMING! no objections, thanks very much for sharing my Zuppa Inglese! Maybe if it was the right wine you may be inclined to dip!lol. I never thought I would and then in Sicily one year, I couldn’t resist. was amazing. Your zuppa inglese looks wonderful. I’m sure flavor was great even w/out the delicious Alchermes:)another fun #recipeswap ! I think I never had Zuppa Inglese. I will have to fix that after seeing your delicious dessert! I love, love, love Tiramisu’ and I have your recipe bookmarked for some future use when the holiday pounds miraculously disappear:) But your Zuppa Inglese looks divine! Beautiful photos, as usual! I love all the childhood memories this swap ignited. This is a great remake! I love that this one comes with such a personal story. I’ve not had zuppa inglese but it is now on my list of things to try. You realize half those things come from your blog. Lol! It does look gorgeous and I have to save I usually prefer the individual dishes over one big dish. It is just somehow prettier and more personal. Love the pop of red. Wonderful job Chef Dennis! A beautifully written post, Chef Dennis! Loved reading every word of it! What a sweet coincidence to run into someone who knew exactly what you wanted and for what purpose. And the dessert looks great. I bet Mama Jeanette would be very proud! That is the sweetest story and also of the man at the liquor counter! This is not my mama’s chocolate pudding. It looks waaaay better! I remember eating this as a kid… gloppy, too sweet and kind of wet in an unpleasant way since I think it had been sitting around a very long time… sort of forgot about it till now. This looks sooo good. What a difference a good recipe makes! Delish! This happily reminded me of the Zuppa Inglese ice cream I used to get in Florence – Yum. Thanks Chef! I have heard of this dessert but really had no idea what it was. I can see how it would be something special to make for someone you’re close to. This sounds wonderful, Dennis! I love the layers of flavor in it. My curiosity got the best of me and I looked up that type of liquor and all I can say is that it’s a shame it doesn’t seem to be around anymore; at least not in the states. It sounds interesting. It is far to early to be discussing Valentine’s Day. We haven’t even hit the greatest of all American holidays, The Super Bowl. 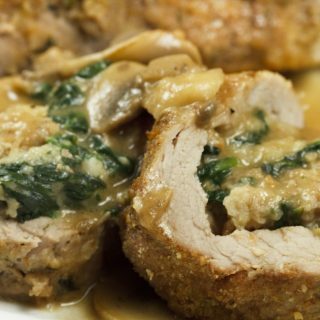 However, as this looks stunning and sounds delicious I will probably make it next weekend for my very Italian grandmother. I so enjoy reading your posts! great story, great dessert, just lovely. I think this would be great for a dinner party, or like you mentioned, Valentine’s Day! These are absolutely gorgeous, and what a great story about your new friend at the liquor store! I’m happy you didn’t go with the maraschino cherry route– ugh, those things make me shudder. But raspberries… now that’s inspiring! Looks divine. Your favorite dessert is tiramisu too!!!!! 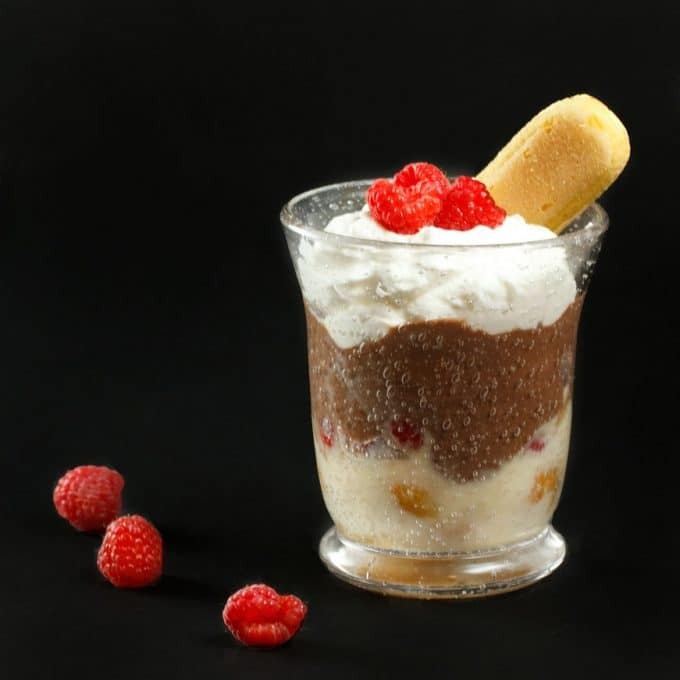 We must have similar tastebuds because your version of the zabaglione has chocolate and raspberries, like mine! But then you go and add rum and vanilla bean *swoon* This looks ridiculously delicious! This looks wonderful – wouldn’t it be gorgeous at a dinner party or a holiday? Ahh, Dennis. Thanks so much for your contribution to the recipe swap. It’s always such a joy to read your posts, and see your approachable, elegant spins on everything. I’m honored you’re a part of the swap! Chef: What a wonderful memory! I find when a recipe comes with happy memories, it always tastes better. Would kirschwasser be a substitute? according to my Italian friend at the liquor store there is no exact substitute, but I’m sure that would work. This looks great, and I love that we both used a recipe of Lidia’s to create our own for the swap. Love her. Ooh, I love zuppa ingelese, it’s so indulgent 🙂 Looks great! I never knew there was an Italian take on the trifle, but think it looks amazing. I wonder where one can get their hands on that cherry liqueur. I’m guessing not anywhere in my rural neck of the woods, huh. It looks fantastic, Chef. Absolutely delicious. Chef Dennis, this is just beautiful, mouth watering, irresistible! I haven’t had Zabaglione in probably 20 years, We would have it severed over fresh fruit by a dear friend of ours. The memories you are bringing back. 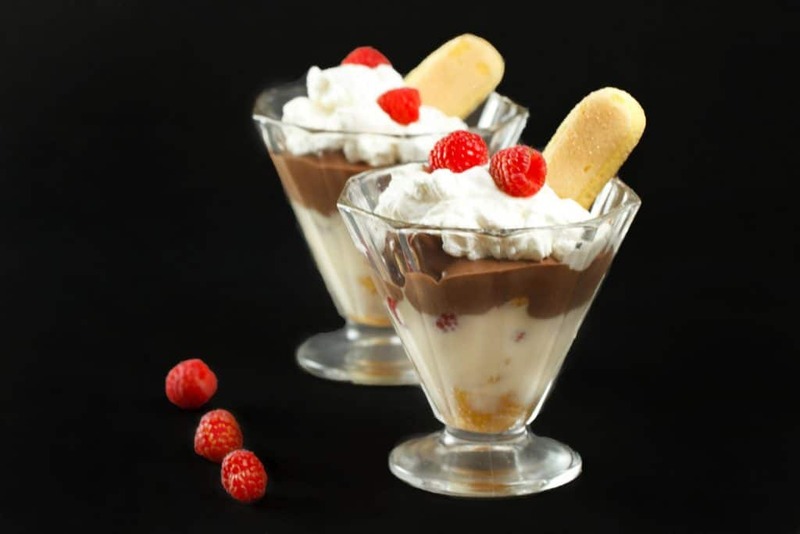 This Zuppa Inglese sounds wonderful along with the precious memories that go along with it! This looks wonderful, Chef Dennis! I love your Mama Jeanette stories. What a blessing she was to you. Have a fabulous week! My gosh, you are making me feel way behind the eight ball when you are already talking about Valentines Day! I know-it will be here before we know it. Finding that special liqueur for recipes can be quite a task, however, I am glad you improvised with the raspberries. Creative and delicious twist on this one, well done! 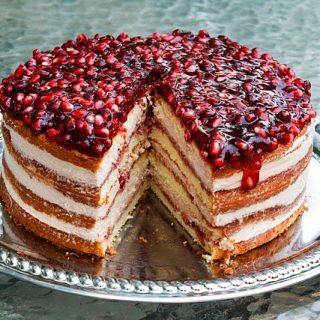 Wow…this is wonderful dessert and I hope I get to make this for the Wild Boar for Valentine’s Day 🙂 thanks for giving me the idea what to serve for dessert on Valentine’s Day . Have a nice day Chef Dennis . That is lovely! Dont you just love old cookbooks? Wonderful. thank you! Beautiful dessert Dennis but of course we’d expect nothing less from you! And having some personal insight on when you started this today, I admire you all the more. I love both this and Tiramisu though they’ve been ‘off the menu’ since I became gluten free. Must see if I can find either a source or recipe for GF ladyfingers. This is just too good to not make!